If your GP wishes to refer you to a clinician and you have chosen Barnsley Hospital, you should agree a convenient date and time for your appointment whilst you are attending the GP surgery. 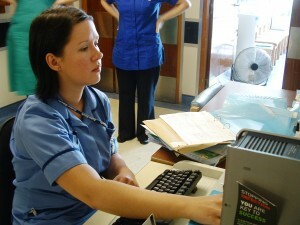 The GP will use the national e-Referral system. A letter will then be sent to you confirming the date and time of your appointment. For some appointments depending what you have been referred for, can be within just a few weeks. Don’t worry this simply means that the waiting times for that department are low at that present time. What happens if there are no appointments? On occasions, depending on how many patients have been referred to the particular clinician, there may not be any appointments available. If this happens, your GP surgery will issue you with a password and a telephone number for the appointments line. You will then need to ring the appointment line to make your appointment. If there are still no appointments available, a message will be sent to the hospital for us to contact you to arrange a suitable date and time. Booking your hospital appointment has never been easier with the introduction of e-Referrals. e-Referrals lets patients book hospital appointments from their GP’s surgery or even better, in the comfort of their own homes on the web or by telephone. Talk to your GP or local support services about the choices that are available to you and where you can get more information and support. NHS Choices provides information you can use to help you make a decision. Discuss your options with family or friends, especially if you are going to need their help with travel arrangements or care after your treatment. Consider your needs and compare each hospital using the information you have, bearing in mind what is most important to you. You will be advised by your doctor on how to book your hospital appointment. Don’t be afraid to ask if you need help. Patient choice has helped hundreds of people in Barnsley pick and choose a hospital appointment to suit them, and has helped shorten waiting times too. If you want to compare us to other hospitals, please use NHS Choices.